Sinopia is proud to introduce our January 2013 Artist of the Month: Kimberly Zsebe. after attaining a BFA in painting and drawing, with a minor in art history from the University of Wisconsin, Milwaukee. She also holds a BA in philosophy from the same school and studied abroad in France and Italy. Zsebe has also pursued her love of photography and has been working therein for some time, both commercially and artistically. However, painting is still the art form closest to her heart, and remains the focus of her creativity. Her work was most recently featured in a Huffington Post article and short film by Eric Minh Swenson and at the Hive Gallery in Los Angeles. Zsebe's work has also been shown at Barnsdale Park, La luz de Jesus, and the Loft at Liza's. 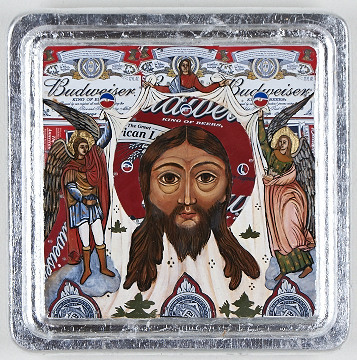 All of which have displayed her most recent work in religious icons. This series was also featured in Studio Visit Magazine and Direct Art Magazine. 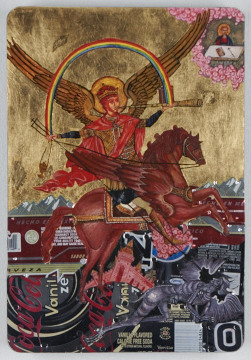 Zsebe's Icon work combines her love of philosophical questioning and her dedication to traditional methods of painting. 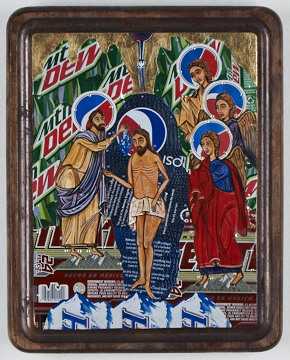 Fun and provocative, familiar yet fresh, these paintings lead the viewer into a dialogue that compares the sanctity of religion to our modern day consumerism. Zsebe's choice of materials combines both the traditional with the non-conventional. 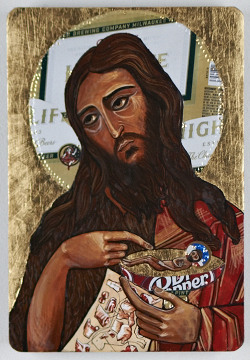 She freely blends the traditional egg tempera made from pigments and egg yolk on panels covered in gold and silver leaf while integrating such pop culture icons as beer cans and soda brand logos.